A judge has issued a preliminary injunction presuming that the Trump administration has violated the constitutional rights of transgender members of the Armed Forces. The White House Administration seems to be facing one obstacle per day. Between a divided GOP, the odyssey of tax reform and an investigation by collusion around the corner, the few decisions really put into action by President Trump are being threatened once again. Such is the case of the decision of Judge Colleen Kollar-Kotelly of the District Court of Columbia, who wrote that, “the Trump administration likely violated transgender service members’ rights under the Fifth Amendment, which guarantees due process under the law," according to The Atlantic. 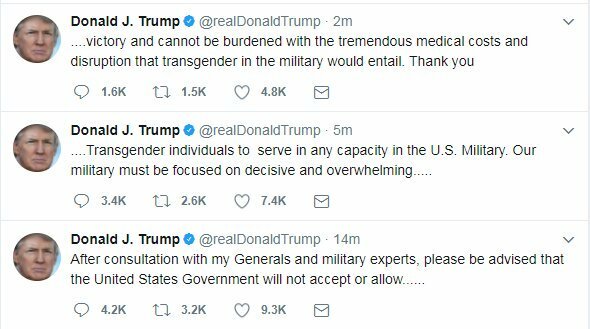 This would have been the direct consequence of President Trump's decision to "ban" transgender citizens to serve in the Armed Forces, which he announced on Twitter during the month of July. "Our military must be focused on decisive and overwhelming victory and cannot be burdened with the tremendous medical costs and disruption that transgender in the military would entail," the president wrote. While the Administration has argued that the ban would be focused on the "best interest of national defense," for the judge there is a significant lack of evidence of the decision and an open tendency to discrimination by the government. “A bare invocation of ‘national defense’ simply cannot defeat every motion for preliminary injunction that touches on the military,” Kollar-Kotelly wrote. In the same way, the president's procedure of "governing through Twitter" implies a lack of "formality or deliberative processes that generally accompany major policy changes that will seriously affect the lives of many Americans", as the judge continues. Although the case is still in its preliminary stage, it is essential because it stops the implementation of the presidential ban, putting on the table a strong legal battle that would exceed the implementation of the deadlines required by the president.